Is there any good news for cattle markets? Home > Cattle > Is there any good news for cattle markets? 01 Aug Is there any good news for cattle markets? 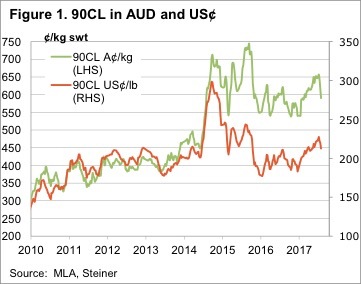 A quick glance at Meat and Livestock Australia’s (MLA) ‘Market Insider’ on Thursday afternoon would be enough to come to the conclusion that we are headed back to 2013 price levels. It’s not that bad, but there is plenty of downside pressure coming on the market. The first story states that US herd expansion is continuing. The latest numbers on the US cattle herd from the United States Department of Agriculture (USDA) put the herd at 102.6 million head. This is a 6 year high, and up 7 million head from the 2014 low. The US have added the equivalent of 25% of the Australian herd in just 3 years. The second story is on beef export prices to the US. This week they fell 7¢/lb in US terms, or 21¢/kg in our terms. Figure 1 shows that it took three months for the 90CL to gain 50¢ in our terms. It takes just two weeks to lose it as issues in Asian markets, and expectations of stronger supplies drive the heavy fall. Obviously the rising Aussie dollar, which went through 80¢ yesterday, has a bit to do with weaker export prices. This was the third story on the ‘market insider’. All this has no doubt contributed to the fourth story, weaker grid prices in Queensland, which has the Heavy Steer 53¢, or 10% below the same time last year. Finally, we come to the fifth story, which is more of the same on the weather forecasting front (Figure 2). 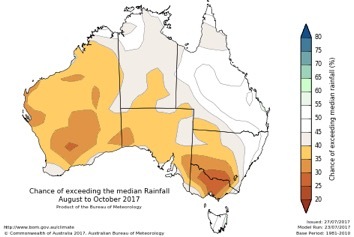 While key cattle areas of Queensland and Northern NSW are back at a 50:50 chance of getting more than the median rainfall, the dry is forecast to continue for southern NSW and much of Victoria. While there is plenty of bad news, the good news is that cattle prices remain anything but disastrous. 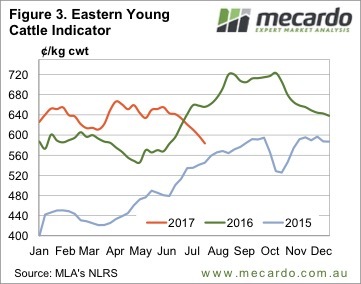 The lower 90CL prices this week brings it into line with the EYCI, despite it falling further to 583¢/kg cwt. The EYCI is now not far off falling below the 2015 price line, and it is strange for it to continue to fall at this time of year. There is a reasonable chance the market will find a base soon.